Educators in the field of food science are increasingly recognizing the value of a culinary background as a stepping stone to better understanding food perceptions, quantifying food qualities and developing more complex food combinations. In fields such as sensory science (the science of evoking, measuring, analyzing and interpreting sensory phenomena), exploration into how we taste and consume foods is developing into a growing field that more and more culinarians are pursuing. For ’04 CIA grad Michael Nestrud, applying sensory science with measurement methods such as projective mapping, also known as the “nappe map” technique, to food, is changing the way we think about flavor combinations. After his CIA graduation, Michael took his computer science background, his love of the culinary, and his interest in science and headed for the Department of Food Science in Cornell’s College of Agriculture and Life Sciences (CALS), where he worked with Dr. Harry Lawless, the world renowned Sensory Scientist. During his undergraduate studies there, he became passionate about becoming what he terms a “culinary scientist”, someone who studies the science of food and human reaction to food from a unique, skilled culinary perspective. His first studies, conducted jointly with the CIA, measured the differences in how culinary professionals and regular consumers evaluated products. This is where he first applied the projective mapping technique, a perceptual mapping technique used to gather data about food similarities through the placement of products on a two-dimensional surface. After completing his undergraduate degree in May of ’08, Michael expanded his research on sensory perceptions by using graph theory, the mathematics behind social networking, to help the military understand how foods are combined together to create meal concepts. This novel technique was used to evaluate menus for military field rations or Meals-Ready-To-Eat (MRE) to develop appealing new combinations. Using this systematic and interactive approach to measure all possible flavor combinations against the best potential combinations, Michael was able to develop a narrowed list of new menus that could be tested by and refined by the Combat Feeding team, resulting in an improved set of meals. Michael has partnered with the Institute for Perception on this technology and continues to work on commercial applications. Michael also serves on the CIA’s Menu R&D Advisory Council and collaborates on research projects with Dr. Chris Loss, the Director. Michael’s career path has not been straightforward but he sees it as the confluence of a number of interests that give him a unique perspective on evaluating food. He originally thought he would study computer science. He then began to read about food science and saw the value of combining CIA and food science degrees. He transferred to the CIA, earned an A.O.S. and completed his studies with a teaching fellowship at the American Bounty exploring operations. While a teaching fellow, he took classes in biology at a local college and applied to Cornell University. While an undergraduate, he spent a summer working for a food development company to understand how new products evolve and then transitioned to his true passion, incorporating the methodical world of mathematical underpinnings with the sensory experimentation and perceptions of food evaluation. With the completion of his Ph.D. in May ‘11, Michael is currently working for the US Army Natick RD&E Center near Boston. While Michael was not a graduate of the collaborative degree program, which is only available within the School of Hotel Administration at Cornell, his experiences at Cornell highlight the many opportunities available to professional culinarians. What’s next for Michael? He will continue his research, exploring the impact that food has on our emotions and moral judgment. 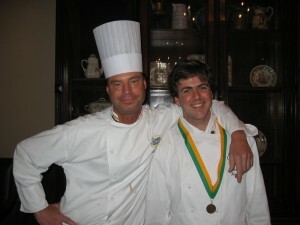 Michael writes about sensory and culinary science at his blog, Substance P, at http://substancep.ataraxis.org. Feel free to contact Michael at mike@ataraxis.org if you have any questions.